Game theory and self esteem dictate that in a competitive space, we’ll avoid the top of the pack. 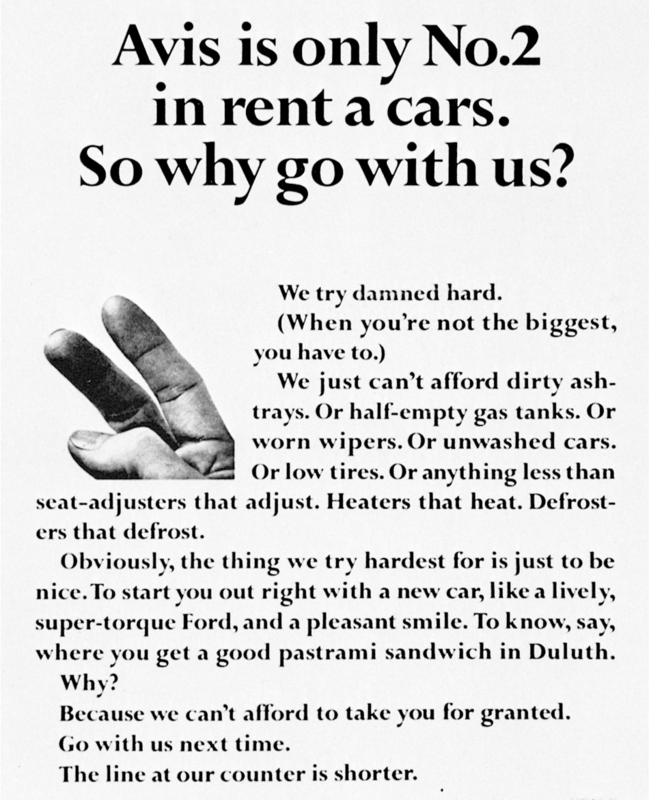 For many years, the car rental company Avis claimed “We’re number two, we try harder.” One year into this advertising campaign the company showed its first ever profit. Four years in, market share grew from 11 percent to 35 percent. Back in 1966, Elliot Aronson ran an experiment to study the relative likeability of people. Some participants listened to audio recordings of someone auditioning for a quiz show who was near-perfect. Other participants heard a more mediocre person audition. Half of each group of participants also heard an extra piece at the end of the recording where the auditioning person spilt coffee on themselves. This blunder made a difference. Of the four experimental conditions (near perfect, near perfect with blunder, mediocre, mediocre with blunder), the superior person was rated most attractive when they blundered, followed by the non-blundering superior person, the non-blundering mediocre person and finally the blundering mediocre person. So it wasn’t the coffee spilling itself that caused the attractiveness rating to rise. The spill actually caused the mediocre person to be rated less attractive. Instead, Aronson proposed that although high levels of competence make us attractive, if we also appear slightly fallible (the pratfall effect) we are seen as more attractive still. The blunder humanizes the superior person and makes him more approachable, less likely to hurt our self-esteem, and therefore more likeable. If you must convince a predominantly male audience who may see you as out of their league, doing something that comparatively improves their self esteem (the pratfall effect) can increase their attraction to you. Show people how choosing your option requires less competition than choosing the number 1 option; for instance less waiting in line, shorter delivery times, lower cost, but just as much satisfaction.